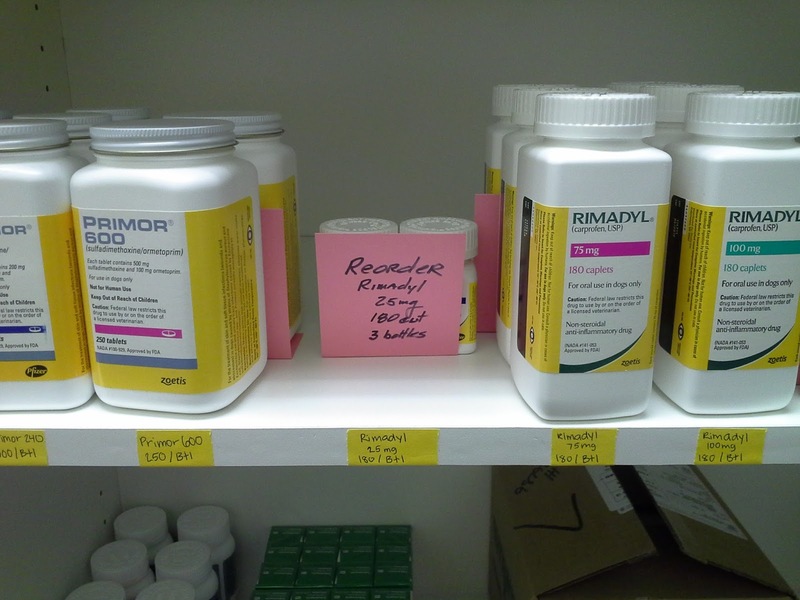 Several months ago, I helped a practice set up a small, experimental kanban system for drug inventory. This particular system uses a kanban card as the signal to re-order. 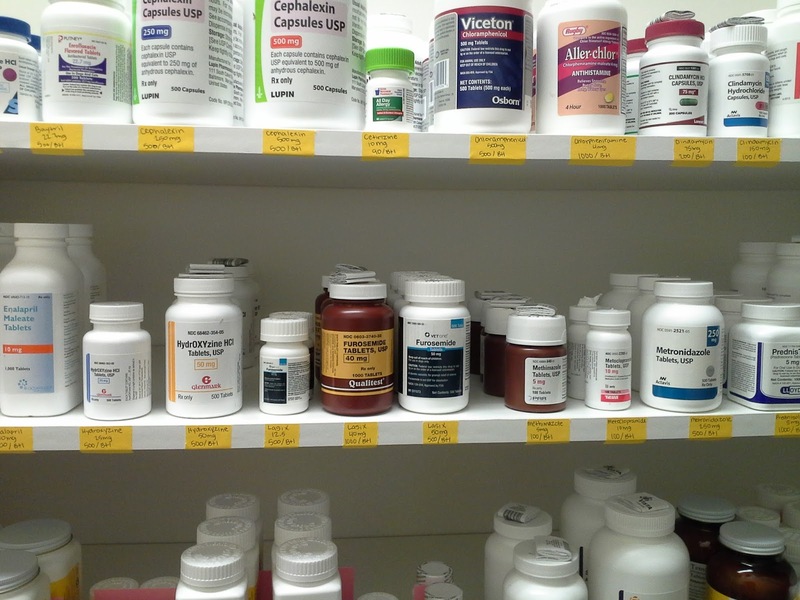 The other common system utilizes two bins to hold a predetermined amount of product. When the first bin is empty, it is removed and placed in a specified place known as a kanban post. From here, someone routinely (determined by standardized work) collects the empty bins and refills them from a central supply area. These bins are then returned and placed under (behind) the bin currently in use. The cycle repeats. This type of system is most often utilized in work areas, such as exam rooms, treatment areas or the lab to manage syringes, blood tubes, gauze squares, microscope slides, etc. This was the “system” that was used previously. 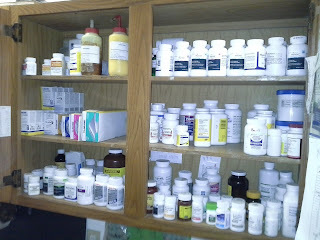 Excess drugs were stored throughout the hospital wherever there was room, such as this exam room cabinet. 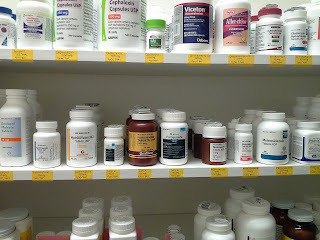 Notice the somewhat haphazard way the bottles are arranged. Nothing is labeled. There are two empty slots on the second shelf. What is missing and needs to be ordered? And, how many? How long has this shortage been going on? 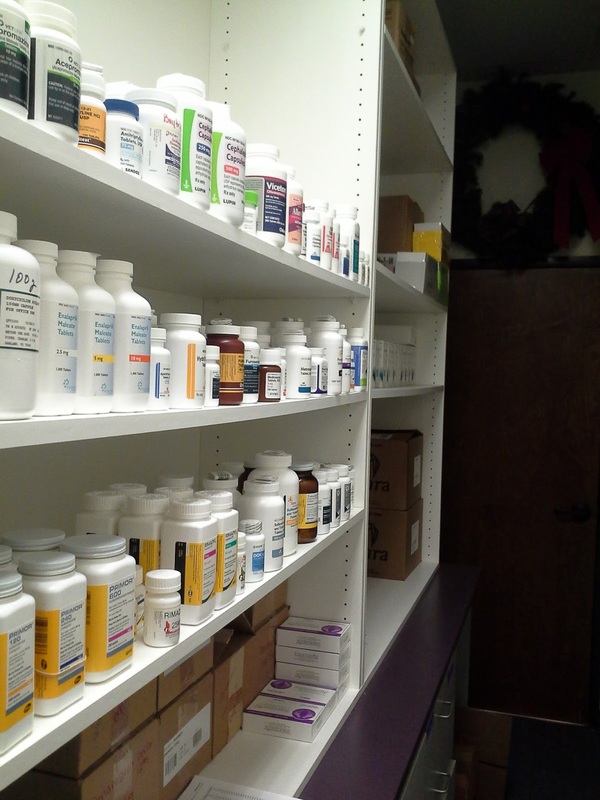 This “system” requires a staff member to go to all the the different “nooks and crannies” in order to create a complete drug order. In addition, this person would need to be experienced enough to “know” what belongs in empty spaces and how many to order. 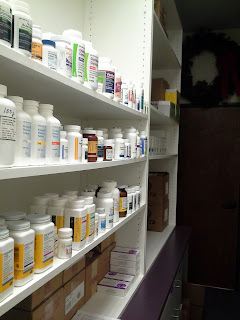 Inventory must be taken daily in order to identify depleted drugs, and get them ordered and delivered, hopefully, before a doctor needs to prescribed them. There is no reserved supply to cover the time necessary to get a new order in. Fortunately, for this hospital, orders placed by 10:00a.m. would be delivered by 3:00p.m. Not horrible, but still a gap before anyone can use the drug. For many hospitals, the lead time is days, not hours. Daily ordering also means daily receiving, daily invoice reconciliation, and daily restocking of shelves. That’s a lot of muda (waste)!! In the new system, a place was found to install a couple of shelf units to experiment with. The drugs and supplies chosen were arranged in alphabetical order, with a few spaces left open for future additions. The front of the shelves were labeled for each item. A place for everything, and everything in its place! Even at this point, a missing item would be noticeable and identifiable. The final step was making and placing the kanban cards (the signals). In order to keep this experiment as inexpensive as possible and to allow for quick, easy changes, I used pink index cards. The cards were bent in an “L” shape so they would stand up and be more visible. On the front of the cards, I wrote the name of the drug, its size (e.g. milligrams), the unit size (e.g. tablets per bottle), the number of units to order and the number of units to keep behind the card. Our goal with this system was to only need to order once weekly. We wanted no more than two months supply up front, if possible, and, at least, one week's worth behind the card. When a new order comes in, the inventory is rotated by placing the items behind the card in front and replacing the reserve stock behind; a FIFO ( First In, First Out) system. Now, once a week, a staff member (any staff member, because the system makes this possible) looks at the shelves and records the item, size and quantity to order. Ba-da-bing, ba-da-boom! An improvement experiment might be to place a bar code on the card and read it with a smartphone or tablet into a form to be faxed or transmitted directly into a vendor's ordering software. There are several Lean concepts here. It is visual. With a single glance and one can see what is needed and what is not. Just-In-Time. Item are only ordered when they are needed and in the amount needed, but before they run out completely. Elimination of waste (muda). Wasted time in ordering, receiving, reconciling and shelving, i.e. once weekly vs once daily. Wasted space in warehousing large amounts of inventory. Wasted use of capital that might be needed for other situations. And, wasted transportation and motion by the vendor. Increased workload on the rest of the staff to “cover” for an employee to handle inventory on a daily basis. Use of small, inexpensive, manual systems to experiment with and work out the “bugs” before investing in and expanding the system to include all other drugs or supplies, such as office supplies, or implementing more advanced technology, such as expensive and cumbersome software. I had the opportunity to speak with the doctors and staff last month. 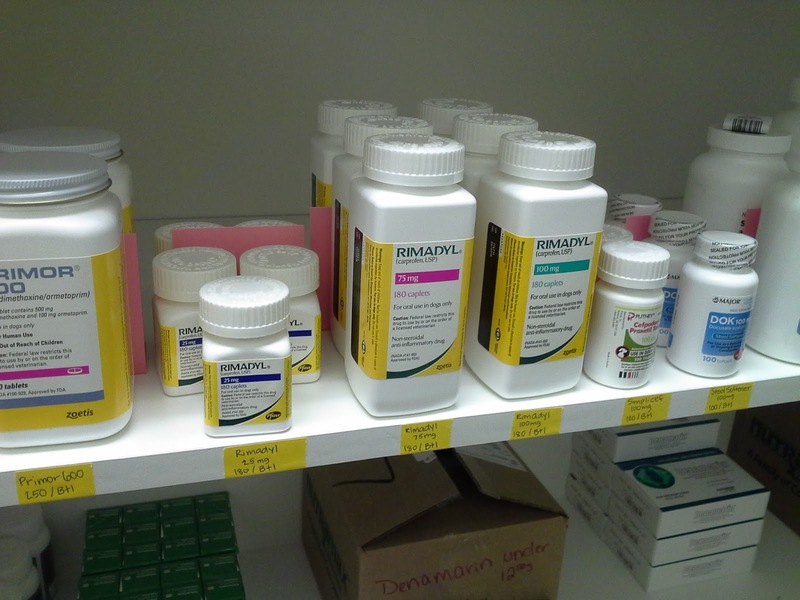 They are still using the system and admitted that it has resulted in near zero shortages of these drugs. They were planning to expand it to other areas in the very near future. Thanks for visiting? Comments and questions always welcome.